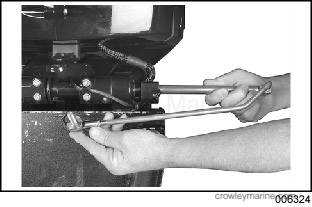 Use this instruction sheet when installing the above kit on tiller equipped Evinrude® E-TEC™ outboards, 40–115 HP. DO NOT install on any other models. It is understood that this instruction sheet may be translated into other languages. In the event of any discrepancy, the English version shall prevail. DO NOT do any repairs until you have read the instructions and checked the pictures relating to the repairs. TO THE OWNER: Save these instructions in your owner’s kit. This document contains information important to the future use and maintenance of your engine. 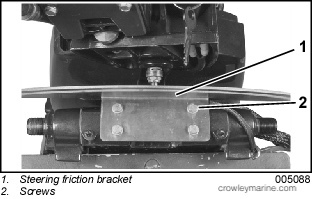 Remove all parts from any previously installed steering friction device. 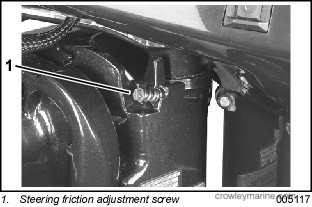 Adjust steering friction adjustment screw on port side of swivel bracket so that no drag is felt on steering. Remove steering arm screw, nut, and washer from forward hole of steering arm and bracket. 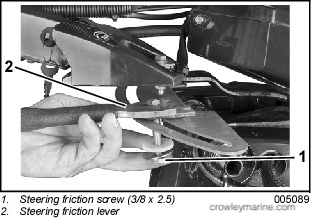 Remove steering friction screw from tiller handle bracket, steering arm, and steering friction lever. 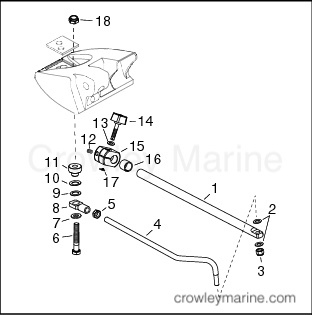 Remove steering friction bracket and screws. Temporarily remove tiller handle bracket from steering arm. Retain rear steering arm screw, nut, and washer. Install steering friction clamp on tilt tube as far as it will go, then back off into position shown, with adjustment knob facing forward. 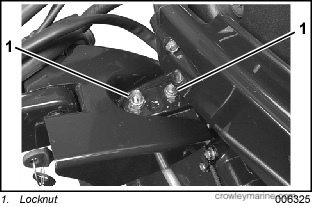 Tighten set screw no more than 60 to 84 in. lbs (7 to 9.5 Nm). 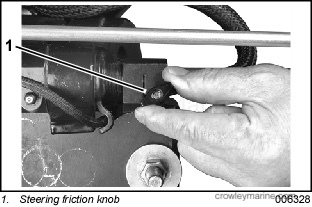 Apply a light coat of Triple-Guard grease to steering friction rod and install through clamp and tilt tube. 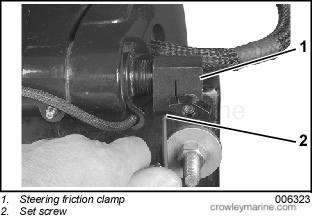 Be sure that plastic bushing is in place inside clamp. Place tiller bracket on steering arm from the bottom. 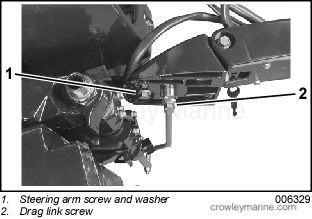 Thread drag link screw through bracket into forward hole of steering arm. 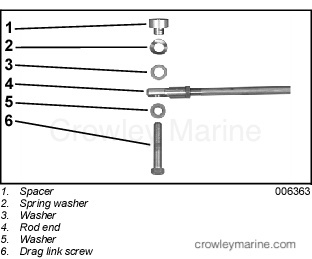 Thread steering arm screw, with washer, into center hole of steering arm. 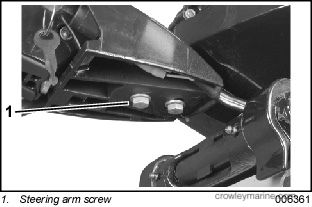 Tighten both screws to a torque of 18 to 20 ft. lbs. (25 to 27 Nm).